..guided by the handsome, cunning yet logically clever, the supreme statesman, Lord Krishna as his companion - as his faithful chariot driver driving him skillfully in the midst of the battle. The enemy - Arjun's own 100 brothers, his own teachers and the elders he respects and their army. But Arjun is NOT ready to fight. He can not understand why he has to slay his own brothers, his own elders and the people he loves just so he could win the war and eventually, a state. 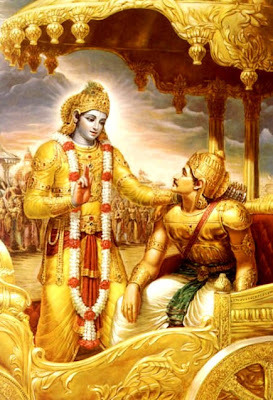 He is confused and looks at Krishna his friend and the chariot driver, for guidance. He asks him if he knows what is going on. Lord Krishna smiles knowingly and halts the moving chariot. The Lord knows what needs to be done now. Arjun clearly needed to know the truth as it is. The world needed to know the truth as it was. It couldn't be hidden anymore. The Lord stands up, and lifts his hand and shows the sky the palm of his right hand. The result is instant and humongous - With the raising of the palm, the Lord did the IMPOSSIBLE. He commanded the all encapsulating, the almighty TIME to STOP. Time froze for unaccountable minutes, maybe hours, maybe days, maybe years. No one knows. And with the stopping of time, the universe froze. The Gods stopped what they were doing and paid attention to what was going to be the 'is all and know all' of all things human !! The ultimate Gyan by the maker of the Universe himself. Arjun couldn't believe what was happening. He fell on his knees with hands folded and said, "Tell me my Lord..tell me." Krishna turned, faced the confused warrior on his knees and said..
परित्राणाय साधुनाम विनाशाय च: दुष्कृताम, धर्मं संस्थापनार्थाय सम्भावामी युगे युगे ||"
“Whenever and wherever there is decay of righteousness, O! Bharat and rise in un-righteousness, I shall manifest myself." Whenever and wherever there is a decline in religious practice, O descendant of Bharata, and a predominant rise of irreligion--at that time I descend Myself. O' brave warrior - the enemy you see is not many but one. That enemy is 'EVIL'. And YOU have been chosen to destroy it...so that righteousness triumphs. Do not hesitate for a moment, do not falter, do what you have been chosen to do. Arjun, This is my lesson to you and all human kind - Never think of the 'result'. Only your deed. For, once you have done your very best of what you have to do...you reach the extreme limit of what is humanly possible. You CANNOT go beyond. And since you cannot go beyond...what happens after; the deciding result of your deed - is NOT for you to decide or understand. Leave that to me. What has to be, will be !!" Lord Krishna said, "Do your Karma, O' great human and leave the rest to me. Let us TRUST him. Let's have FAITH !!! 29 Spoke their mind: yep, makes a difference !! Heyy Gautam, Ur comment is a pleasant s'prise. Thanx much. Btw,u can see my religios side only if I turn left. My left towards u if ur standing with ur back towards me. Confused?? Nev mind.So am I. Lol. Hi Rohit, I haven't learned Sanskrit either. My will to know of these words lead me to search the net and finally when I knew.. I decided to put it down for everyone to know. prabhu ki leela sach main aprampaar hai. The ancient scriptures, Vedas and the Epics of India are the infinite wealth of wisdom. Verdict: "karam karo fal ki iccha mat karo"
Ankita...That's it. BUt be warned - It's very difficult to do that. Stupid, y do u preach widout any homework? U have written "Abhyuthanam Adharmasya" which means for the abhuday (meaning: upliftment and betterment) of Adharm(meaning: evil doing and improper way 2 lead life) U tried to say here that God reincarnates again n again for the upliftment of Adharm? Rewrite it as Abhyuthanam Dharmasya n rectify ur blog as well as urself. chk this-> http://www.asitis.com/4/7.html and u will knw the right version. As for who has to do his homework...my explanation below should make that quite clear. Your explanation is understandable only to you..
"whenever there is rise of irreligion..is when I will come". "Whenever and wherever there is a decline in religious practice, O descendant of Bharata, and a predominant rise of irreligion--at that time I descend Myself." Now, open your eyes and ears and read this very very carefully....and learn...as I explain each WORD of the verse. The meaning of the verse word for word is this..
Kindly rectify yourself and your way of speech first before you comment on somebody's character and on something you do not know of. here dharma should never be taken as equivalent/equal/or synonym to religion. i dont think there is any word equivalent to dharma in english . Hi Anonymous (19,20,21)...I can't really comment on this since I don't possess expert knowledge on the topic. But..for the information you have provided...thank you so much. Appreciate it. It is a very informative site.you can see this site also. Anon 23 - As long as the word leads one to Peace, love and respect....let it be any word. Some typos are there in the Shloka -- please correct them, compare to the original text. Hi C Parthapratim, thanx for your feedback. I have done the needful and added the shloka in Hindi too. I hope that would make it easier. some one said correctly..Dharma has no equivalent word in English..the Europeans and da whole of western society also use the words Dharma and karma....it is not religion. It maybe religious though. Good one buddy, i could only hope that more and more young guys in India tread the same path. Modernism with values. Kudos! And yes, the fact that TIME STOPPED was a revelation.